Runyan calls that moment “magic.” She also uses the word “surprise.” It’s the moment when you finally find the light switch. I think most writers know this feeling, whether they’re poets or not. It’s that moment when you find yourself in unexpected territory, and even if you can’t articulate why, you know you’re on holy ground. Recently, we attended a production of the play “Greater Tuna” along with a discussion led by one of the show’s creators and original performers, Jaston Williams. The show is largely a comedy, with enough jokes and gags to offend pretty much everyone in the audience. But there is a moment that usually does not offend people—it’s when the play takes a very dark turn. It seems to come out of nowhere, yet it feels completely justified. I think that scene in the funeral parlor is one reason “Greater Tuna” is the most-produced play in the United States. Jaston Williams said the scene just sort of sprang up in the midst of writing a bunch of loosely connected comedic sketches. It ties everything together. I haven’t yet figured out how to tie everything together in my poem, to make that light come on in this dark room. The editor in me decided to look up whether either Potter or Randall county is dry, and neither is. (For you non-Texans, a dry county or precinct is one in which sales of alcohol are illegal.) I also don’t know anything about snakes in the Panhandle, so I chased that one for a while too. Not sure if my innate need to fact-check is killing my poetic instincts. Here’s draft No. 4 of my poem. in a dry Texas county. This chapter includes two fantastic poems. One I knew, “Course,” by LW Lindquist, and one I didn’t, “Tree,” by Andrew Hudgins. Runyan encourages readers to notice the line breaks in these poems and experiment with doing it differently. I didn’t want to mess with perfection, so I played around with a poem titled “Courage” by Amelia Earhart—pilot and poet. First, here is her original poem with the proper line breaks. to behold resistless day and count it fair. What do you think? Would you do it differently? Back to my poem, revising with an emphasis on line breaks. Something is happening at the end—something not based on the day we planted the cross, other than the fact that it is always windy in the Panhandle. It’s something that snuck in because I found the word “zephyr,” which will eventually change the poem. Think about that word, “hive.” I can’t read it it without hearing the buzzing of bees. She also encourages us to use word lists to choose the word that evokes sound or that simply sounds good when read aloud. So in my next draft of my poem, I did consult ye olde thesaurus. A couple of those words made it to the final draft. just past mile marker 95. Then Runyan provides two poems as examples, except one is not an actual poem—it’s lifted from a travel site. My favorite part of the chapter is when she provides sentences from rest stop brochures and asks us to rewrite them with an eye toward poetry. Here is my second draft of the poem. My first was so bad—I literally just added line breaks to the freewriting. I was not particularly in a poem-y mood and couldn’t think of anything else to do. This second draft, based on this chapter, is going for more imagery. My title, taken from Runyan’s prompt, has never changed. is not nestled in some Dead Man’s Curve. so flat you can see the earth curve. “Do not cross” says the words on the yellow tape. wind knocks us to our knees. As with Tania Runyan’s companion book, “How to Read a Poem,” this one is also organized around Billy Collins’ poem titled “introduction to poetry.” The first chapter is about getting started. Instead, she says to start with freewriting. I started doing this a little more than a year ago. What started as a journal got too maudlin, and so I veered into freewriting. Now my columns, my poems, even the intros and conclusions to articles usually emerge in my freewriting. 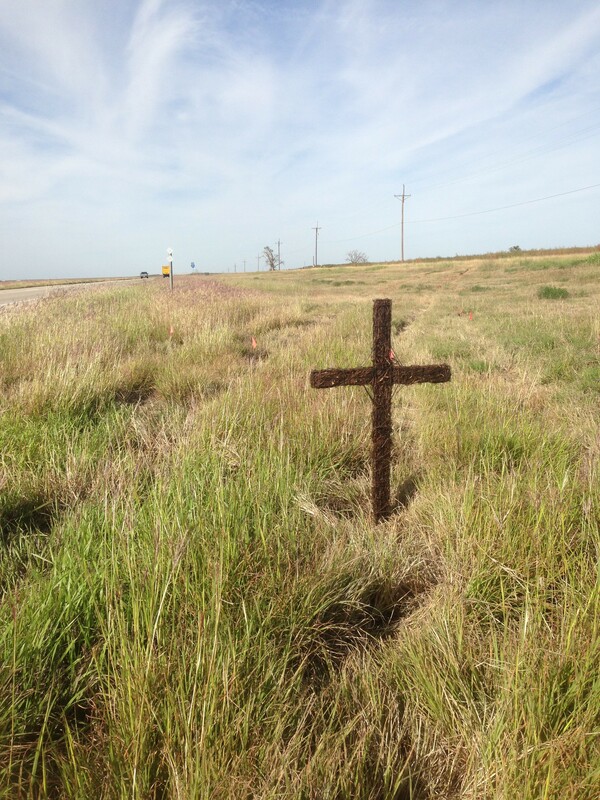 As I said in my last post, I wanted to write about the day my brother planted a cross beside the highway where my cousin died. In Runyan’s book, she shares her freewriting followed by several drafts of the resulting poem. I’ll do the same here. One of Runyan’s prompts was “a roadside oddity,” which will eventually become the title of my poem. It’s not a roadside oddity. There’s nothing odd about seeing a cross on a Texas highway. Although this one is not in some dead man’s curve or at the edge of a cliff. It’s just past mile marker 95 on I-27. Miles of flat pasture, so flat you can see the curve of the earth. How could anything happen here? How do you crash when there’s nothing to run into? And the cross—not white but made from grapevine. Brown. Adorned with tacky fake flowers, which, he told me, he tore off and threw away. Bare brown. Rising above the parched October grass. “Careful. There could be snakes,” he says. But there’s no water. Is it a dry county or only partially wet? The sky is white, clouds streaked across like someone poured all the water into the white and thinned it and painted over what had to be a better blue. Tire tracks lead nowhere. “Do not cross” the sign says. We cross. We walk unshielded, unbidden and plant a cross where nothing grows. 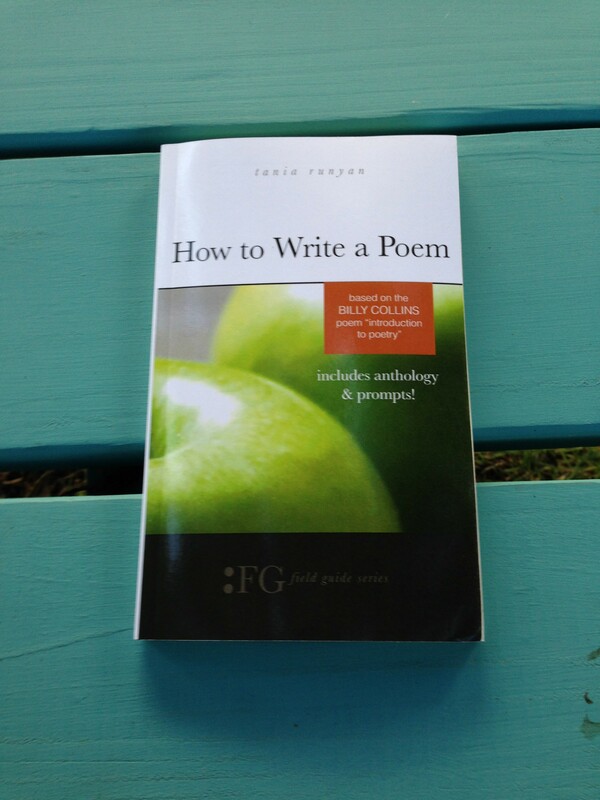 My copy of Tania Runyan’s new book, “How to Write a Poem,” came in last week. And since I was in between cycles for the magazine, I decided to put myself through a poetry workshop, one chapter at a time. It’s a book to be worked through, not simply read. Each chapter begins with a poem, and I highly recommend taking time to sit with each one. Read it silently, then aloud. Journal it. There’s a lot to discover. The book is titled “How to Write a Poem,” and I’d put the emphasis on “a poem.” In chapter 1, Tania has you do a freewriting exercise, and from that, begin a poem. The rest of the book gives you opportunities to revise that poem, looking at it from different angles. I chose a topic I’d started on October 4, 2014, after my cousin Ashley Meagher died in a car accident. I’d made notes for a poem, especially following her funeral, but those words never went anywhere. Still, it felt like a poem that needed to be written. Following Tania’s guidance, I did seven drafts. Since my poetry usually begins in experiences, actual life scenes, I have trouble making the sort of changes that would improve the poem and take it out of its original context in some way—maybe a different speaker or a different color of the sky. It’s a poem, not memoir. So for any family members reading this poem, it is no longer an exact chronicle of what happened the day Dylan planted the cross beside the highway. For that, I have a photograph. I toss the lot into the wash.
a little bitty baptism and spin dry on the casual setting. to the waves lap against the hull. Perfect. And a tad profane, but I don’t mind. In full disclosure, I edited an early draft of the book, but I still enjoyed reading the final version last night. It’s short, the equivalent of 40 pages. Anna writes a monthly column for the WACOAN magazine called “Notes From a New Mother,” although she’s not so new at motherhood anymore or at country living. But she combines the two in ways I, as a city girl, would never think to. My favorite part is near the end, when after returning from a sonogram appointment, she sits on the front porch “for five solid minutes,” and she has, shall we say, a moment with a chicken. Followed by an imaginary chewing-out from her rooster, (King) Kenny III. My children are nearly grown—one in college, one a junior in high school. I have no advice for moms, new or otherwise. Some days I think I’m going crazy. 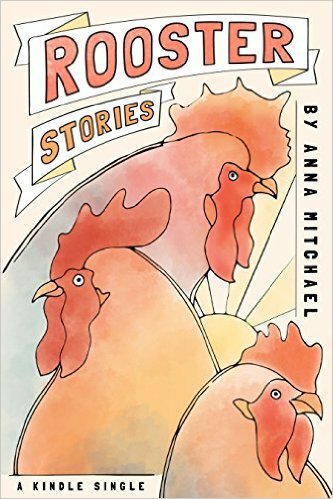 “But crazy felt more honest than yet another apology.” Observations about the behavior of a succession of roosters named Kenny (after Rogers) and a duo of chickens nicknamed The Uglies in the context of early parenthood makes so much more sense to me than the latest mommy manual. And when Anna said she had stopped flashing forward because “I discovered it was not in my nature to flash forward to times of sweeping happiness,” I nodded my head in understanding. Like her, I’ve found happiness in unexpected places, even in a fresh egg.